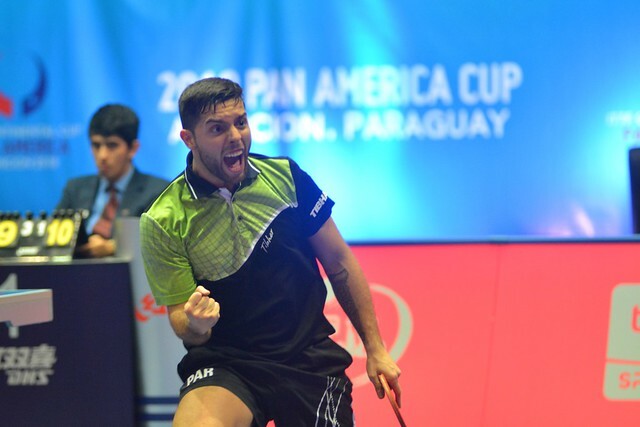 Two days of promotion prior to the commencement of the 2018 Pan America Cup, in the main commercial centre of Asuncion, the country’s capital city, the Paraguay Table Tennis Federation organised a major campaign to create interest in the forthcoming prestigious tournament. Supported by the National Olympic Committee, Marcelo Aguirre and Lucero Ovelar, who will represent Paraguay in the respective Men’s Singles and Women’s Singles at the forthcoming tournament which commences on Friday 15th June, were both present. A most successful event was organised; people from all walks of life and from a wide range of ages tried their hand at table tennis. The man behind the initiative was Benjamin Real, President of the Paraguayan Table Tennis Federation and the South American Table Tennis Confederation; he was present alongside Gonzalo Barak, the ITTF Marketing Director for Pan America. Matters concluded with Marcelo Aguirre and colleagues from the national team posing for photos with local people and presenting prizes. Notably present was Diego Lopez, well-known nutritionist and promoter of sport in Paraguay. On social networks, he highlighted the importance and benefits of playing table tennis. Now a taste of high level sport awaits. The 2018 Pan American Cup is a qualification tournament for the Liebherr Men’s World Cup and the Uncle Pop Women’s World Cup to be held later this year.